Next: Next post: THE GOOD GOVERNANCE AGENDA — CHARLES WILKIN QC – 31ST MAY 2018. This video is a historical review of how the modern day Zionist state of Israel came into being, including the Rothschild connection. 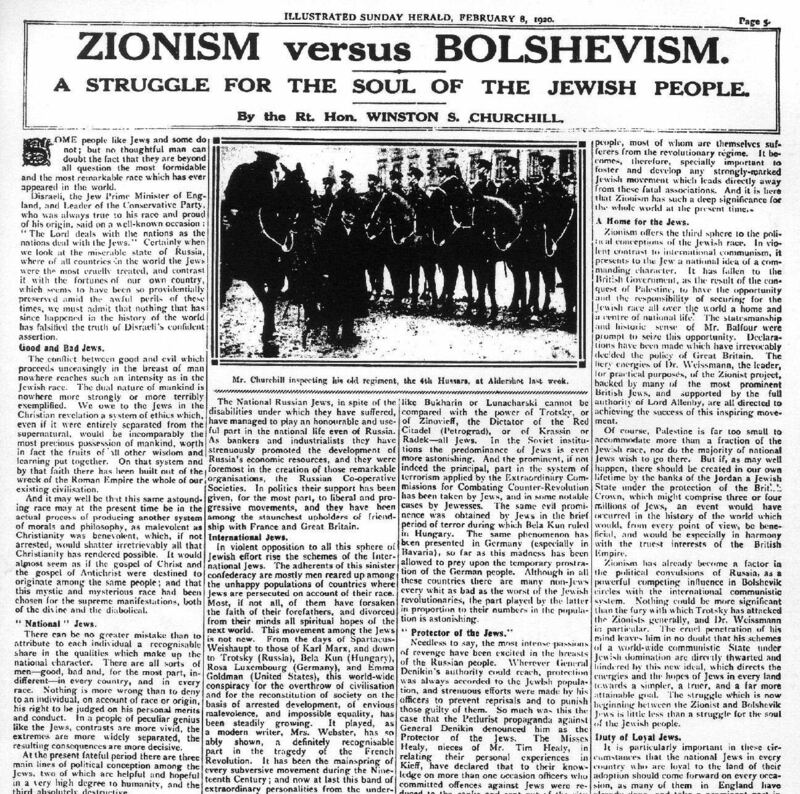 ZIONISM versus BOLSHEVISM. A STRUGGLE FOR THE SOUL OF THE JEWISH PEOPLE. Disraeli, the Jew Prime Minister of England, and Leader of the Conservative Party, who was always true to his race and proud of his origin, said on a well-known occasion: “The Lord deals with the nations as the nations deal with the Jews.” Certainly when we look at the miserable state of Russia, where of all countries in the world the Jews were the most cruelly treated, and contrast it with the fortunes of our own country, which seems to have been so providentially preserved amid the awful perils of these times, we must admit that nothing that has since happened in the history of the world has falsified the truth of Disraeli’s confident assertion. The conflict between good and evil which proceeds unceasingly in the breast of man nowhere reaches such an intensity as in the Jewish race. The dual nature of mankind is nowhere more strongly or more terribly exemplified. We owe to the Jews in the Christian revelation a system of ethics which, even if it were entirely separated from the supernatural, would be incomparably the most precious possession of mankind, worth in fact the fruits of all other wisdom and learning put together. On that system and by that faith there has been built out of the wreck of the Roman Empire the whole of our existing civilisation. There can be no greater mistake than to attribute to each individual a recognisable share in the qualities which make up the national character. There are all sorts of men – good, bad and, for the most part, indifferent – in every country, and in every race. Nothing is more wrong than to deny to an individual, on account of race or origin, his right to be judged on his personal merits and conduct. In a people of peculiar genius like the Jews, contrasts are more vivid, the extremes are more widely separated, the resulting consequences are more decisive. First there are the Jews who, dwelling in every country throughout the world, identify themselves with that country, enter into its national life, and, while adhering faithfully to their own religion, regard themselves as citizens in the fullest sense of the State which has received them. Such a Jew living in England would say, “I am an Englishman practising the Jewish faith.” This is a worthy conception, and useful in the highest degree. We in Great Britain well know that during the great struggle the influence of what may be called the “National Jews” in many lands was cast preponderatingly on the side of the Allies; and in our own Army Jewish soldiers have played a most distinguished part, some rising to the command of armies, others winning the Victoria Cross for valour. The National Russian Jews, in spite of the disabilities under which they have suffered, have managed to play an honourable and useful part in the national life even of Russia. As bankers and industrialists they have strenuously promoted the development of Russia’s economic resources and they were foremost in the creation of those remarkable organisations, the Russian Co-operative Societies. In politics their support has been given, for the most part, to liberal and progressive movements, and they have been among the staunchest upholders of friendship with France and Great Britain. In violent opposition to all this sphere of Jewish effort rise the schemes of the International Jews. The adherents of this sinister confederacy are mostly men reared up among the unhappy populations of countries where Jews are persecuted on account of their race. Most, if not all, of them have forsaken the faith of their forefathers, and divorced from their minds all spiritual hopes of the next world. This movement among the Jews is not new. From the days of Spartacus-Weishaupt to those of Karl Marx, and down to Trotsky (Russia), Bela Kun (Hungary), Rosa Luxembourg (Germany), and Emma Goldman (United States), this world-wide conspiracy for the overthrow of civilisation and for the reconstitution of society on the basis of arrested development, of envious malevolence, and impossible equality, has been steadily growing. It played, as a modern writer, Mrs. Webster, has so ably shown, a definitely recognisable part in the tragedy of the French Revolution. It has been the mainspring of every subversive movement during the Nineteenth Century; and now at last this band of extraordinary personalities from the underworld of the great cities of Europe and America have gripped the Russian people by the hair of their heads and have become practically the undisputed masters of that enormous empire. There is no need to exaggerate the part played in the creation of Bolshevism and in the actual bringing about of the Russian Revolution by these international and for the most part atheistical Jews. It is certainly a very great one; it probably outweighs all others. With the notable exception of Lenin, the majority of the leading figures are Jews. Moreover, the principal inspiration and driving power comes from the Jewish leaders. Thus Tchitcherin, a pure Russian, is eclipsed by his nominal subordinate Litvinoff, and the influence of Russians like Bukharin or Lunacharski cannot be compared with the power of Trotsky, or of Zinovieff, the Dictator of the Red Citadel (Petrograd), or of Krassin or Radek – all Jews. In the Soviet institutions the predominance of Jews is even more astonishing. And the prominent, if not indeed the principal, part in the system of terrorism applied by the Extraordinary Commissions for Combating Counter-Revolution has been taken by Jews, and in some notable cases by Jewesses. The same evil prominence was obtained by Jews in the brief period of terror during which Bela Kun ruled in Hungary. The same phenomenon has been presented in Germany (especially in Bavaria), so far as this madness has been allowed to prey upon the temporary prostration of the German people. Although in all these countries there are many non-Jews every whit as bad as the worst of the Jewish revolutionaries, the part played by the latter in proportion to their numbers in the population is astonishing. Needless to say, the most intense passions of revenge have been excited in the breasts of the Russian people. Wherever General Denikin’s authority could reach, protection was always accorded to the Jewish population, and strenuous efforts were made by his officers to prevent reprisals and to punish those guilty of them. So much was this the case that the Petlurist propaganda against General Denikin denounced him as the Protector of the Jews. The Misses Healy, nieces of Mr. Tim Healy, in relating their personal experiences in Kieff, have declared that to their knowledge on more than one occasion officers who committed offences against Jews were reduced to the ranks and sent out of the city to the front. But the hordes of brigands by whom the whole vast expanse of the Russian Empire is becoming infested do not hesitate to gratify their lust for blood and for revenge at the expense of the innocent Jewish population whenever an opportunity occurs. The brigand Makhno, the hordes of Petlura and of Gregorieff, who signalised their every success by the most brutal massacres, everywhere found among the half-stupefied, half-infuriated population an eager response to anti-Semitism in its worst and foulest forms. Zionism offers the third sphere to the political conceptions of the Jewish race. In violent contrast to international communism, it presents to the Jew a national idea of a commanding character. It has fallen to the British Government, as the result of the conquest of Palestine, to have the opportunity and the responsibility of securing for the Jewish race all over the world a home and a centre of national life. The statesmanship and historic sense of Mr. Balfour were prompt to seize this opportunity. Declarations have been made which have irrevocably decided the policy of Great Britain. The fiery energies of Dr. Weissmann, the leader, for practical purposes, of the Zionist project, backed by many of the most prominent British Jews, and supported by the full authority of Lord Allenby, are all directed to achieving the success of this inspiring movement. Of course, Palestine is far too small to accommodate more than a fraction of the Jewish race, nor do the majority of national Jews wish to go there. But if, as may well happen, there should be created in our own lifetime by the banks of the Jordan a Jewish State under the protection of the British Crown, which might comprise three or four millions of Jews, an event would have occurred in the history of the world which would, from every point of view, be beneficial, and would be especially in harmony with the truest interests of the British Empire. 1901: The Jews from the colonies set up in Palestine by Edmond James de Rothschild, send a delegation to him which tell him, “If you wish to save the Yishuv (The Jewish settlement) first take your hands from it, and for once permit the colonists to have the possibility of correcting for themselves what needs correcting.” Edmond James de Rothschild is very angry about this and states, “I created the Yishuv, I alone. Therefore no men, neither colonists nor organisations have the right to interfere in my plans.” The Rothschild banking-house in Frankfurt, Germany, M. A. von Rothschild und Söhne, closes as there is no male Rothschild heir to take it on. 1902: Philippe de Rothschild born. 1907: Rothschild, Jacob Schiff, the head of Kuhn, Loeb and Co., in a speech to the New York Chamber of Commerce, warns that, “Unless we have a Central Bank with adequate control of credit resources, this country is going to undergo the most severe and far-reaching money panic in its history.” Suddenly America finds itself in the middle of another typical run of the mill Rothschild-engineered financial crisis, which ruins as usual ruins the lives of millions of innocent people throughout America and makes billions for the Rothschilds. 1909: Jacob Schiff founds the National Advancement for the Association of the Coloured People (NAACP). This was done to incite black people into rioting, looting and other forms of disorder, in order to cause a rift between the black and white communities. Jewish historian, Howard Sachar, states the following in his book, “A History of the Jews in America,” “In 1914, Professor Emeritus Joel Spingarn of Columbia University became chairman of the NAACP and recruited for its board such Jewish leaders as Jacob Schiff, Jacob Billikopf, and Rabbi Stephen Wise.” Other Ashkenazi Jew co-founders included Julius Rosenthal, Lillian Wald and Rabbi Emil G. Hirsch. It was not until 1920 that the NAACP appointed its first black president, James Weldon Johnson. Maurice de Rothschild marries Ashkenazi Jew, Noémie Halphen. 1913: On March 4, Woodrow Wilson is elected the 28th President of the United States. Shortly after he is inaugurated, he is visited in the White House by Ashkenazi Jew, Samuel Untermyer, of law firm, Guggenheim, Untermyer, and Marshall, who tries to blackmail him for the sum of $40,000 in relation to an affair Wilson had whilst he was a professor at Princeton University, with a fellow professor’s wife. President Wilson does not have the money, so Untermyer volunteers to pay the $40,000 out of his own pocket to the woman Wilson had had the affair with, on the condition that Wilson promise to appoint to the first vacancy on the United States Supreme Court a nominee to be recommended to President Wilson by Untermyer. Wilson agrees to this. Jacob Schiff sets up the Anti Defamation League (ADL) in the United States. This organisation is formed to slander anyone who questions or challenges the Rothschild global conspiracy as, “anti-semitic.” Strangely enough, the same year that they do this they also set up their last and current central bank in America, the Federal Reserve. Congressman Charles Lindbergh stated following the passing of the Federal Reserve Act on December 23, “The Act establishes the most gigantic trust on earth. When the President signs this Bill, the invisible government of the monetary power will be legalized…….The greatest crime of the ages is perpetrated by this banking and currency bill.” It is important to note that the Federal Reserve is a private company, it is neither Federal nor does it have any Reserve. It is conservatively estimated that profits exceed $150 billion per year and the Federal Reserve has never once in its history published accounts. 1914: The start of World War I. In this war, the German Rothschilds loan money to the Germans, the British Rothschilds loan money to the British, and the French Rothschilds loan money to the French. Futhermore, the Rothschilds have control of the three European news agencies, Wolff (est. 1849) in Germany, Reuters (est. 1851) in England, and Havas (est. 1835) in France. The Rothschilds use Wolff to manipulate the German people into a fervour for war. From around this time, the Rothschilds are rarely reported in the media, because they own the media. 1916: On June 4, Ashkenazi Jew, Louis Dembitz Brandeis is appointed to the Supreme Court of the United States by President Wilson as per his agreed blackmail payment to Samuel Untermyer some three years earlier. Justice Brandeis is also the elected leader of the Executive Committee for Zionist Affairs, a position he has held since 1914. The middle of World War I Germany was winning the war as they were being financed by the Rothschilds to a greater extent than France, Italy and England, because Rothschilds, did not want to support the Tsar in Russia, and of course Russia was on the same side as France, Italy and England. Then a significant event occurred. Germany, although they were winning the war and not one foreign soldier had set foot on their soil, offered armistice to Britain with no requirement of reparations. The Rothschilds were anxious to make sure this didn’t happen as they were expecting to make far more money off this war, so they played another card they had up their sleeve. Whilst the British were considering Germany’s offer, Rothschild agent Louis Brandeis sends a Zionist delegation from America to Britain to promise to bring America into the war on the side of the British, provided the British agree to give the land of Palestine to the Rothschilds. The Rothschilds wanted Palestine for the following reason: They had great business interests in the far east and desired their own state in that area along with their own military which they could use as an aggressor to any state that threatened those interests. The British subsequently agree to the deal for Palestine and the Zionists in London contact their counterparts in America and inform them of this fact. Suddenly all the major newspapers in America that up to that point had been pro-German turned on Germany running propaganda pieces such as: German soldiers were killing Red Cross Nurses; German soldiers were cutting off babies hands, etc, in order to manipulate the American public against the Germans. 1917: As a result of Germany’s offer of peace the Rothschild war machine goes into overdrive in America, spreading propaganda which leads to President Wilson under the instructions of American Zionist leader and Supreme Court Justice, Louis Dembitz Brandeis, reneging on his promise to the electorate and taking America into the first world war on April 6. As per the Rothschild Zionist promise to the British, to take America into the war, they decide they want something in writing from the British to prove that they will uphold their side of the bargain. The British Foreign Secretary, Arthur James Balfour therefore drafts a letter which is commonly known as the, “Balfour Declaration,” which is reprinted below. 1919: In January, Ashkenazi Jews, Karl Liebknecht and Rosa Luxemburg, are killed as they attempt to lead another Rothschild funded Communist coup, this time in Berlin, Germany. The Versailles peace conference is held to decide reparations that the Germans need to pay to the victors following the end of the first world war. A delegation of 117 Zionists headed up by Ashkenazi Jew, Bernard Baruch, bring up the subject of the promise of Palestine for them. At this point the Germans realised why America had turned on them and under whose influence, the Rothschilds. The Germans, naturally, felt they had been betrayed by the Zionists. This is because, at the time the Rothschilds made their deal with Britain for Palestine, in exchange for bringing America into the war, Germany was the most friendly country in the world towards the Jews, indeed the German Emancipation Edict of 1822 guaranteed Jews in Germany all civil rights enjoyed by Germans. Also, Germany was the only country in Europe which did not place restrictions on Jews, even giving them refuge when they had to flee from Russia after their first attempted Communist coup failed there in 1905. Nevertheless, the Rothschilds had held up their side of the bargain to spill the blood of millions of innocents and as a result, Palestine is confirmed as a Jewish homeland, and whilst its handover to the Rothschilds takes place it is to remain under the control of Britain as the Rothschilds control Britain. At that time less than one percent of the population of Palestine was Jewish. Interestingly, the host of the Versailles peace conference is its boss, Baron Edmond de Rothschild. The Versailles peace conference is also used as an attempt by the Rothschilds to set up a world government under the pretext of ending all wars (which they create). This was called the, “League of Nations.” Fortunately not enough countries accepted it and so it soon died. On March 29th The Times of London reports on the Bolsheviks in Russia,”One of the curious features of the Bolshevist movement is the high percentage of non-Russian elements among its leaders. Of the twenty or thirty commissaries, or leaders, who provide the central machinery of the Bolshevist movement, not less than 75% were Jews.” It is reported that the Rothschilds were angry with the Russians because they were not prepared to allow them to form a central bank within their nation. They therefore gathered groups of Jewish spies and sent them into Russia to drum up a revolution for the benefit of the common man, which was actually a takeover of Russia by a Rothschild-controlled satanic elite. These Jewish spies were, in age-old deceptive Ashkenazi tradition, given Russian names, for example Trotsky was a member of the first group and his original name was Bronstein. These groups were sent to areas throughout Russia to incite riots and rebellion. The Jewish Post International Edition, week ending January 24th 1991, confirms Vladimir Lenin was Jewish. Lenin is also on record as having stated, “The establishment of a central bank is 90% of communizing a nation.” These Jewish, Rothschild funded Bolsheviks would go on in the course of history to slaughter 60 million Christians and Non-Jews in Soviet controlled territory. Indeed the author Aleksandr Solzhenitsyn in his work, “Gulag Archipelago, Vol 2,” affirms that Zionist Jews created and administered the organized Soviet concentration camp system in which these tens of millions of Christians and Non-Jews died. On page 79 of this book he even names the administrators of this the greatest killing machine in the history of the world. They are Aron Solts, Yakov Rappoport, Lazar Kogan, Matvei Berman, Genrikh Yagoda, and Naftaly Frenkel. All six are Zionist Jews. In 1970 Solzhenitsyn would be awarded the Nobel Peace Prize for literature. 1921: Under the orders of Jacob Schiff the Council on Foreign Relations (CFR) is founded by Ashkenazi Jews, Bernard Baruch and Colonel Edward Mandell House. Schiff gave his orders prior to his death in 1920, as he knew an organisation in America needed to be set up to select politicians to carry on the Rothschild conspiracy,and the formation of the CFR was actually agreed in a meeting on May 30, 1919 at the Hotel Majestic in Paris, France. The CFR membership at the start was approximately 1000 people in the United States. This membership included the heads of virtually every industrial empire in America, all the American based international bankers, and the heads of all their tax-free foundations. In essence all those people who would provide the capital required for anyone who wished to run for Congress, the Senate or the Presidency. The first job of the CFR was to gain control of the press. This task was given to John D. Rockefeller who set up a number of national news magazines such as Life, and Time. He financed Samuel Newhouse to buy up and establish a chain of newspapers all across the country, and Eugene Meyer also who would go on to buy up many publications such as the Washington Post, Newsweek, ant The Weekly Magazine. The CFR also needed to gate control of radio, television and the motion picture industry. This task was split amongst the international bankers from, Kuhn Loeb, Goldman Sachs, the Warburgs, and the Lehmanns. 1925: This year’s Jewish Encyclopaedia, states of the existence of Ashkenazi Jews (who represent approximately 90% of so-called world Jewry), with the startling admission that the so-called enemy of the Jews, Esau (also known as Edom, see Genesis 36:1), now actually represents the Jewish race, when on page 42 of Volume V it is stated, “Edom is in modern Jewry.” So what they’re basically saying is that these Ashkenazi Jews, who represent 90% of the so-called Jewish population, are actually gentiles or goyim themselves. 1930: The first Rothschild world bank, the, “Bank for International Settlements (BIS),” is established in Basle, Switzerland. The same place as where 33 years earlier the first ever World Zionist Congress was held. 1933: On January 30, Adolf Hitler becomes Chancellor of Germany. He drives Jews, many of which were Communist out of Governmental positions within Germany. As a result of this, in July, the Jews hold a World Conference in Amsterdam during which they demand that Hitler re-instate every Jew back to his former position. Hitler refuses and as a result of this, Samuel Untermyer, the Ashkenazi Jew who blackmailed President Wilson,and is now the head of the American delegation and the president of the whole conference, returns to the United States, and makes a speech on radio which was transcribed in the From the New York Times, Monday, August 7, 1933. In the speech he made the following statements, “…the Jews are the aristocrats of the world…Our campaign is…the economic boycott against all German goods, shipping and services…What we are proposing…is to prosecute a purely defensive economic boycott that will undermine the Hitler regime and bring the German people to their senses by destroying their export trade on which their very existence depends… …Each of you, Jew and Gentile alike…must refuse to deal with any merchant or shopkeeper who sells any German-made goods or who patronizes German ships or shipping.” (Remember, the Rothschild instigated Germany to hate Jews and vice versa) As two-thirds of Germany’s food supply had to be imported, and could only be imported with the proceeds of what they exported, if Germany could not export, two-thirds of Germany’s population would starve, as there would be not enough food for more than one-third of the population. As a result of this boycott, Jews throughout America, would protest outside and damage any stores in which they found any products with, “Made in Germany,” printed on them, causing stores to have to dump these products or risk bankruptcy. Once the effects of this boycott began to be felt in Germany, the Germans, who had demonstrated no violence towards the Jews up to this point, simply began boycotting Jewish stores in the same way the Jews had done to stores selling German products in America. Rothschild financed IBM, supply machines to the Nazis which produce punch cards to help organize and manage the initial identification and social expulsion of Jews, the confiscation of their property and their extermination. On November 16, President Roosevelt recognizes the Zionist regime of Stalin in Russia without consultation with Congress even as 8,000 Ukrainians march in protest in New York. 1938: On 7th November, a Jew, Herschel Grynszpan, assassinated Ernst vom Rath, a minor official at the German Embassy in Paris. As a result of this German hostility towards Jews in Germany started to turn violent. The Rothschilds Austrian banking house in Vienna, S. M. von Rothschild und Söhne, closes following the Nazi occupation of Austria. 1939: I.G. Farben the leading producer of chemicals in the world and largest German producer of steel dramatically increases its production. This increased production is almost exclusively used to arm Germany for the Second World War. This company was controlled by the Rothschilds and would go on to use Jews and other disaffected peoples as slave labour in the concentration camps. I.G. Farben also created the lethal Zyklon B gas that was used to exterminate the Jews. On 1 September, the Second world war starts when Germany invades Poland. This was because the German leadership were a (psuedo) Christian leadership, who understood that Soviet Russia was led by Rothschild funded Communists, and they feared that as the Soviet Union grew in strength, these Jewish Communists would invade and wipe all the Christians off the map. 1940: Hansjurgen Koehler in his book, “Inside The Gestapo,” states the following, of Maria Anna Schicklgruber, Adolf Hitler’s grandmother, “A little servant girl came to Vienna and became a domestic servant at the Rothschild mansion and Hitler’s unknown grandfather must be probably looked for in this magnificent house.” This is backed up by Walter Langer in his book, “The Mind Of Hitler,” in which he states, “Adolf’s father, Alois Hitler, was the illegitimate son of Maria Anna Schicklgruber. Maria Anna Schicklgruber was living in Vienna at the time she conceived. At that time she was employed as a servant in the home of Baron Rothschild. As soon as the family discovered her pregnancy she was sent back home where Alois was born.” On the surface, it would appear Hitler was unlikely to be a Rothschild, but then again, when you discover the benefits that the Rothschilds got out of this war, both financially and politically, a Rothschild connection does not appear as outlandish as it may initially seem. 1942: Prescott Bush, father of future American Presidents’ George Herbert Walker and George W, has his company seized under the, “Trading With The Enemy,” Act. He was funding Hitler from America, whilst American soldiers were being killed by German soldiers. Jews are also being slaughtered by these same soldiers. Interestingly the ADL never criticizes any of the Bushes for this. 1943: February 18th, Zionist, Izaak Greenbaum, head of the Jewish Agency Rescue Committee, in a speech to the Zionist Executive Council states, “If I am asked, could you give from the UJA (United Jewish Appeal) monies to rescue Jews, I say, no and I say again no!” He would go onto state, “One cow in Palestine is worth more than all the Jews in Poland!” This is not a surprise, the whole idea of Zionist support for the slaughter of innocent Jews was to scare the survivors into believing that their only place of safety was Israel. How else do you think the Zionists could ensure Jews leave the beautiful European cities in which they live, in order to settle in a desert! 1944: On 6 November Lord Moyne, British Minister Resident in the Middle East was assassinated in Cairo by two members of the Jewish terrorist group, the Stern Gang, led by future Prime Minister of Israel, Yitzhak Shamir. He is also responsible for an assassination attempt against Harold MacMichael, the High Commissioner of the British Mandate of Palestine, this same year. Interestingly he also masterminds another successful assassination this year against the United Nations representative in the Middle East, Count Folke Bernadotte who, although he had secured the release of 21,000 prisoners from German camps during World War II, was seen by Yitzak Shamir and his terrorist collaborators as an anti-Zionist. The speech is based on Childs’ experience in the Middle East, particularly Palestine and Saudi Arabia where he was close to King ibn Saud in the critical period of 1946-1950. It refers to the “immensely powerful Zionist lobby in the United States” having “bent American foreign policy” from one of benevolence “to an undisguised defense of Israel, to the prejudice of American international interests in the Middle East, in particular our oil interests as well as the attainment of peace” and describes how, from a “position of universal respect and good will we once enjoyed in the Arab world before creation of the State of Israel, we are left with no firm friends on whom we may count in that area except Israel”. Childs blames the oil-shock of 1973 on anger against the US due to its support of Israel. Some months ago, at the invitation of the NSA/CSS International Affairs Institute, Mr. J. Rives Childs, a former U.S. Ambassador to Ethiopia and Saudi Arabia, spoke in the Friedman Auditorium about his observation of events in the Middle East. The views he expressed regarding the origin and nature of the conflict in that area aroused a great deal of controversy and sparked many a lively debate among those who attended. A shortened version of Mr. Childs address is reproduced here for those who missed his talk and for those who might wish to examine his views more carefully. The Arab-Israeli problem presents one striking dilemma for those who would weigh the scales between the two parties. It is that both have suffered appalling wrongs: the Jews at the hands of the Nazis, which impelled their search for a safe haven: the Arabs from their dispossession, to make way in Palestine for the Jews, to right a wrong for which they had no responsibility. Nor let us overlook the fact that for the Arabs Jerusalem is as much a sacred city as it is for Jews and Christians. As a Foreign Service officer I spent the best part of my life in the Middle East. When asked to speak to you, it seemed to me that that I could not do better than present certain representative experiences I had in two of the most crucial and neuralgic areas of the Near East, namely Palestine, from which Israel was carved, and Saudi Arabia. To form an adequate appreciation of why there has been such persistent turmoil in the Near East since the termination of the First World War, one must review, if only briefly, events from that period. We shall find that the present deeply disturbed situation has its inception almost in toto from the so-called Balfour Declaration of 1917 and the subsequent creation in 1948 of the State of Israel. The Balfour Declaration was a British wartime measure designed to rally world Jewry for the Allied cause. Britain was fighting with its back to the will and there was no time for searching scrutiny of legal niceties. The Declaration was a grab-bag into which almost anything could be read and as such was to have most fateful consequences. It also expressly excluded certain specific contingencies which nevertheless came in the end to eventuate by supreme irony of the Gods. Let us examine this fateful instrument. First of all, let us note that there is no mention in it of a Jewish State. All it contemplated was the establishment in Palestine of a National Home for the Jewish people. There was an all important limiting provision that, in its fulfillment, “nothing shall be done which may prejudice the civil and political rights of existing non-Jewish communities in Palestine,” a strangely elliptical reference to the Arab population comprising no less than 90 per cent of the total population of Palestine. In short, it was a provision, if any attention was to be paid to it, which rendered completely nugatory the Declaration itself. It was the sort of double-talk which from its very inception characterized the Balfour Declaration and the Jewish National Home in Palestine. Bluntly, it constituted nothing less than a most cruel deception. From the establishment of Ihe British mandate over Palestine in 1922 until its termination in 1948, with creation of the State of Israel, British policy oscillated between one or the other of the two incompatible provisions of the Balfour Declaration, depending on the shifting international situation and the degree of pressure brought to bear by the United States on the British under American Zionist pressure. Note that the primary objective of the Balfour Declaration was the promotion of Jewish immigration into Palestine. Yet this was not realizable without prejudice to the rights of the preponderant Arab population. If is important to bear in mind that not all Jews are Zionists. Rabbi Judah Magnes, a distinguished Jewish-American, head of the Hebrew University in Jerusalem until his death in 1948 urged a binational State for Palestine envisaging an Arab-Jewiih partnership. Had his counsel prevailed there would be peace in the Near East. It is significant that even today voices are not wanting in continued support of this solution. Zionist pressure on the United States government manifested itself as early as 1917 when President Wilson’s endowment of a Jewish National Home in Palestine was obtained. There were not lacking eminent American Jews who actively opposed Zionism for one reason, amongst others, that it would distract American Jews from a full allegiance to American citizenship and its obligations. With the end of World War 1 a slow but steady trickle of Jewish immigration into Palestine passed almost unpercieved. However, stimulation of an active antiSemitic movement in Germany under mounting Nazi provocation in the the 1920s resulted in an increased flow of Jews into Palestine with a counter reaction on the part of Arabs, culminating in civil disturbances. These became in time such that the British Government was persuaded, in the interests of the maintenance of law and order, to introduce checks on Jewish immigration into Palestine. Reaction of American Zionists was swift and quite unprecedented. The time was 1938, when I was on duty in the State Department, charged, amongst other things, with serving as desk officer for Palestine. Within a few days we were submerged by some 100,000 letters and telegrams from Zionists and Zionist sympathies appealing for United States intervention with the British Government in opposition to any reduction of Jewish immigration into Palestine Rarely in American history had there been such political action to influence public policy. Shortly thereafter, Secretary of State Hull summoned a conference on the issue. The group included Under Secretary of State Summer Wells, Assistant Secretary Adolph Berle. the Legal Advisor Green Hackworth, Chiefs of the Near Eastern and European Divisions and a dozen or more others. I could not ponder my reply but answered it after only an instant of reflection: “Because of the attachment of every man for his own hearthstone”. I have never since been able to think of a better response, but I have often regretted that I did not have the courage to have preceded my reply by inquiring of the Secretary if he could think of any inducement that might be offered the native population of Tennessee to move out of that State to make way for foreign newcomers. Press reports telegraphed from the United States to the Middle East of the political pressure brought to bear upon the White House gave rise to a quite new development in the Arab world, namely violent anti-American manifestation, as reported by the Associate Press from Jerusalem, on November 1, 1938. Until then the United States had enjoyed in Palestine. Egypt, Arabia, Iraq, Lebanon, Syria and Jordan, as well as throughout the Moslem world, a highly priviledged place, enhanced by the presence in Cairo of an American University and a long-respected American College in Beirut. We were looked on as the most disinterested of all foreign powers. For one who had gone out as early as 1919 to the Near East, as I had, in the heyday of our universal esteem, it was tragic to observe, from the 1930s, its progressive decline until today only the shattered shreds of it wave tattered in the breeze. At attempt by the British Government to organize a conference in London to work out a mutual agreement between Arabs and Jews having proved fruitless, it issued a declaration on May 17 1939 fixing unilaterally its future policy. Jewish immigration into Palestine would be permitted until the Jewish proportion of the population had risen from the then existing ratio of 28 to 33-1/3 per cent. The Government observed that the framers of the Palestine mandate “could never have intended that Palestine would be converted into a Jewish State against the will of the Arab population of that country.” It was a belated admission but nevertheless one taking into account practicable and equitable realities. Outbreak of the Second World War in 1939 suspended implementation of the new administrative measures contemplated for Palestine. The next most important development affecting Palestine was the historic meeting on February 24, 1945, between President Roosevelt, returning from Yalta, and the aging King of Saudi Arabia, which took place on an American destroyer in the Suez Canal. Ibn Saud’s recently created kingdom in the barren wastes of the Arabian peninsula was but slowly adapting itself to the ways of the modern world. With the conclusion of agreements in the early 1930s with American oil interests for the exploitation of what was to prove one of the richest sources of petroleum in the world, diplomatic relations had been established between the United States and Saudi Arabia. These were destined to develop into very close ties, the closest of those with any Arab State and only disturbed by the appearance upon the scene in 1948 of the newly created State of Israel, which has remained until the present time [1977 – ed] unrecognized by any Arab State. In the course of the historic meeting between President Roosevelt and the Saudi King, the former gave his personal assurance to the latter that the United States would not change its Palestine policy without full and prior consultation with both Arabs and Jews. This undertaking was reaffirmed after Roosevelt’s death by his successor, President Truman, in a formal communication of April 5. 1945 to King ibn Saud. Four months later, in August 1945, with the ink hardly dry on the assurance given. President Truman requested the British to facilitate the admission into Palestine of 100,000 Jewish immigrants. A few months later, in December 1945. resolutions were passed by the United States Senate and House for unrestricted Jewish immigration into Palestine, limited only by the economic absorptive capacity of that country. Following the Six-Day War of 1967 … President Johnson and Nixon assured they would press Israel to relinquish conquered Arab territory, nothing happened … In the Spring of 1972 Washington conveyed hints to Feisal that if he would help to persuade President Sadat to diminish the enormous Russian presence in Egypt, the U.S. would mount more serious pressure upon Israel … Sadat expelled the Russians in July of that year. But Nixon ignored this momentous action. Feisal felt humiliated and betrayed. In 1946 I was appointed by President Truman as American Minister to Saudi Arabia after twenty-three years in the career Foreign Service. On July 1, 1946, I presented my letter of credence in Jeddah to His Royal Highness Prince Feisal in his capacity as Foreign Minister and Viceroy of Hejaz. At dinner that evening he emphasized that a fair solution of the Palestine question was a matter of life or death to the Arabs, who viewed Zionist aspirations in Palestine as having the ultimate aim of swallowing up the Arab world. He said that his country and the Arab world were placing great store in the sense of justice of the United States. ‘I AM CONVINCED THAT UNLESS WE PROCEED WITH UTMOST CIRCUMSPECTION, IN CONSIDERING ALL PHASES OF POSSIBLE REPERCUSSIONS OF PALESTINE QUESTION, WE MAY RAISE DIFFICULTIES FOR OURSELVES IN THIS MOST STRATEGIC AREA OF VITAL NATIONAL INTEREST WHICH WILL PLAGUE UNITED STATES IN YEARS TO COME “[1. Foreign Relations of the United States, 1946, Near East and Africa, vol.Vii, page 641. The preponderant Arab population expressed violent opposition, and in March 1948 fighting broke out in Palestine. [Probably much earlier – ed] The United Stain expressed opposition to a forcible implementation of partition and, three days later, called for declaration of a truce and further consideration of the problem by the General Assembly of the U.N. The Zionists, insisting that partition was binding, launched military operations to establish their State. Jewish terrorists of the Irgun, a factional organisation, massacred 250 civilian inhabitants of the Arab village, Beit Yasin [usually rendered Deir Yassin – ed] putting it to fire and sword. The result was that anticipated by the attackers: panic on the part of the Palestine Arabs, who fled in thousands for safety to nearby Arab countries. Events now succeeded one another on seven-league boots. On May 14. 1948, the British Mandatory Adminisitration ceased to exist with the withdrawal of the British High Commissioner. On the same day the State of Israel was proclaimed in Jerusalem and at the same time recognised by President Truman. From that time to this there has been no peace in the Near East nor any acceptance of Israel by the Arab world. The first reaction of the Arabs was an unsuccessful attempt on their part to invade Israel. Their repulse resulted in the flight with them of thousands of Arabs previously inhabiting Palestine. For almost thirty years these have subsisted as homeless refugees housed in tents or given shelter in Lebanon, Syria, Iraq, Jordan and elsewhere. In the years which have followed, American newspapers, responsive to Zionist advertisers, particularly in the East where large numbers of Jews are concentrated, exercised a virtual boycott of news favorable to the Arabs. A striking example was given me in 1950 when visiting Lynchburg on my return from Saudi Arabia by a reporter of the Lynchburg News In discussing the reserve of the American press to Arab news, she recalled the reaction of a Jewish resident of the city who had telephoned the News, after publication of the photograph of an Arab child refugee, to inquire whether this reflected any anti-Semitic attitude. Shortly afterward the United States Air Force invited me to visit a number of air bases where Saudi Arabian nationals were being trained under an accord with the Saudi Arabian Government by which, in return, we were granted certain facilities at their airports. My first stop was at the air base at Wichita Falls, Teifas. When a reporter sought to interview me, the American General commanding the base informed me privately that he would have to telephone Washington for permission, as there had been a strict security regulation against giving out any information about the presence on the bases of Arab trainees The reason given was to avoid any hue and cry on the part of the Zionists. Happily a telephone call elicited approval from Washington. The sequence of events accorded with these expectations. In its issue of July 7 1973 from Paris the International Herald Tribune reported that King Feisal of Saudi Arahia warned that the traditionally strong Saudi ties with the United States “depend on the United States having a more even-handed and just policy” in the Middle East. It was added that Saudi Arabia might be compelled to freeze its oil production because of rising Arab resentment over United States support of Israel. From a position of universal respect and good will we once enjoyed in the Arab world before creation of the State of Israel, we are left with no firm friends on whom we may count in that area except Israel. The immensely powerful Zionist lobby in the United States, centering its influence on the government, has bent American foreign policy from one of benevolent but essentially passive approval of the aims of the Balfour Declaration to an undisguised defense of Israel, to the prejudice of American international interests in the Middle East, in particular our oil interests as well as the attainment of peace. Let it be emphasized that the Arabs do not expect us to cut Israel adrift but only that we maintain an even balance in our relations with these opposing forces. We are not asked to abandon Israel or leave that country to its own devices. We are only asked to refrain from interposing our influence to give that power an unfair advantage vis-a-vis the Arabs. When I served in Saudi Arabia from 1946 to 1950, a critical period of that country’s evolution, I had many intimate conversations with the venerable, sagacious King ibn Saud. A constant refrain ran through his many declarations to me of his strong desire for close friendly relations with the United States. He and his sons who have succeeded him ask to that end only that we maintain an even keel and not favour Israel at Arab expense. It is a fateful issue and demands the exercise by us of even-handed justice in the preservation by us of fundamental American interests in a highly strategic area of our troubled world.